I created this card about six months ago for a hero-themed call at Paper Crafts magazine. I was thrilled when it was picked up for publication in a special issue called Handmade Cards, available (in print) starting today. I used Little Yellow Bicycle's Just Because line because it gives the card an understated patriotic look. I layered up diecuts, product packaging and embellishments inside the frame for a clean, clustered look. 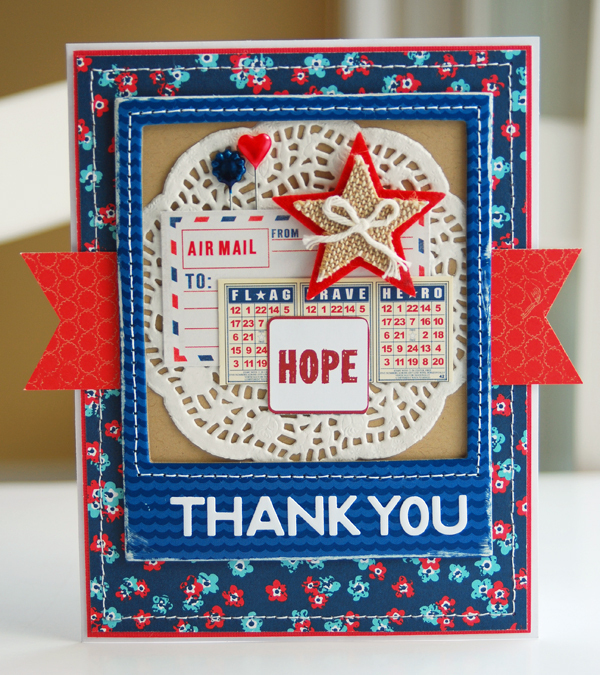 Darling card and hooray for your publication! This is gorgeous!! I loveeeeeeeee the colors, the star and the stitching!!!! What a wonderful card, congrats on the publication! Congrats on the publication! The card is very eye-catching. Another awesome creation! Congrats on the pub!!! Wonderful card! Congrats on your publication! Gorgeous card!! Absolutely love the design and colors!! Lisa, your tiny detail attention is just awesome!! You rock it, girl. Was so happy to see you featured at SS - yay for you! What a lovely card! Beautiful job! Such a great card! Congratulations on the publication. Congrats!!! Its a beautiful card I can see why they picked it up. Congratulations on being published! This card is truly a winner. Those teeny Bingo cards have me sighing over their adorableness! Adorable card Lisa!! Congrats on the pub! Love the Red, White and Blue and the pretty doily in the center! Wow - that is just wonderful! Love it! And I love your blog header - love the design! Love this. Congrats on the pub. Always exciting to get a PC pick up!